Another month in the books. The New Versa had a great month selling 11,800 units. The Mazda2 and Suzuki SX4 also has good gains vs. this time last year. Fiesta and Soul continue sell in droves, and even the Smart ForTwo managed a gain compared to last year. The big looser was the Kia Rio. It's a bit unfair, since the old Rio is in short supply and the new ones are just hitting the lots. 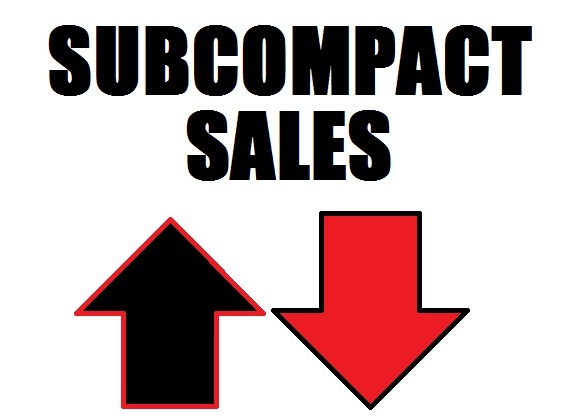 Ditto that with the Aveo since the Sonic, as evidenced in the chart below, is also on sale now. No excuse for the Nissan Cube, which sold just 440 units last month, however. The redesigned Yaris is also about to hit dealer lots, so it'll be interesting to see how it sell. Click the jump for the full chart. Man, the Cube is gonna be slaughtered in sales. I never minded the square shape, but I guess it's just too unique for the USA. And maybe all the other, sleeker and more traditional styles that are coming out (and have come out) are making it a difficult sale too. I read an article saying Nissan is reducing the amount of Cubes it is importing to the US. They are focusing on selling more Jukes instead. The Scion iQ should be hitting showrooms on the West Coast this month. It would be interesting to see how these sell compared to the Smart. -It's quite a change to see the Smart in the green on the monthlies. Maybe M-B taking distribution over from Penske is finally starting to stick. -The new Accent is still in short supply. Apparently Mini's been having supply issues too. -LOOK at those YTD percentage gains for the Fiesta and CR-Z. While Hyundai has made great strides in the compact and mid-size segments, with the new Elantra and Sonata, arguably the car that put it on the map was the sub-compact Accent. While a less-than-great piece of engineering in the past, it did serve a purpose. Hyundai Veloster? Will that be on this list eventually? I think it sold 834 in September, or maybe it was 837. 830something.